If you are planning to climb 8000 meter peak, then Mount Manaslu is the best option. This peak is the world's eight highest mountain to climb. Satori Adventures has projected fixed departure climbing for Mt. Manaslu in spring 2017. The confirmed fixed departure date for mountain expedition offers you an opportunity to share the permit, join individual or group climbers with international climbing team. The Manaslu expedition spring package let you save your budget, share permit fee, climb with other climbers and summit the peak with professional climbing Sherpas with private care and support. Why Manaslu Climbing in Spring? 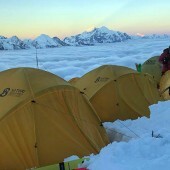 Spring season starts from March and ends at April in the Himalayas is considered as the best mountaineering time. The success rate of climbing in spring is high and many climbers preferred this season. In spring the temperate gradually raises and snow falling in the Himalayas become stopped. The snowy starts to melt and the climbing route can be fixed easily in compare to other season. The visibility of mountain is high and due to the warm weather, climbing is easier. Even though, sometimes melting snow may cause problem to climb. Spring season is more windy then autumn, so this might be difficult to climb. For the pleasant weather in spring, climbers feel more comfortable to climb. Due to the low snowing and raining, climbing in spring to this mountain is recommended. 11Apr/Day 02: Preparation, briefings, last minute shopping and permit formalities. 17 April/Day 08: Trek from Namrung to Lho (3150m/10334ft) 5hrs. Tea house/camping. 21-19May/D12-40: Climbing period. (8163m/26781ft.) Camping. 21 May/Day 42: Trek from Base Camp to Sama Gaun (3780m/12401ft) 3hrs. Tea house. 22 May/Day 43: Trek from Sama Gaun to Namrung(2550m/8366ft) 6hrs. Tea house/camping. 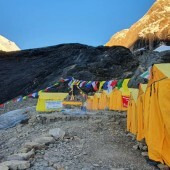 23 May/Day 44: Trek from Namrung to Philim village (2300m/7546ft-06hrs) Tea house/camping. 25 May/Day 46: Trek from Machakhola to Arughat (950m3117ft) 8hrs. Tea house/camping. 26 May/Day 47: Drive from Arughat to Kathmandu (1350/4429ft) 7 hrs. Transportation provided by tourist mini bus.Hotel accommodation in Kathmandu. 27-29 May/Day48-49: Free day.Relax and shop in Kathmandu. Farewell celebration dinner with cultural program in the evening. 30 May/Day 50: Transfer to Kathmadnu airport for final departure.